I saw this clever healthy treat on Pinterest and thought it looked like something that a) I could probably make and b) my kids might actually eat. This past weekend, I had to bring "a salad" to our parish Fall Festival. 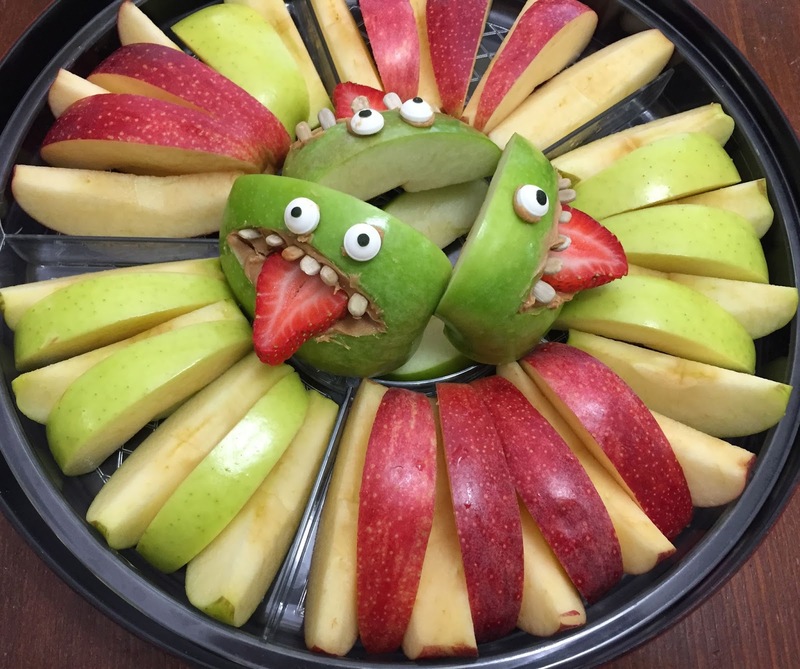 I thought apple slices would be easy and kid-friendly, and would give me a chance to try this out. I think they turned out really well! I used peanut butter & store-bought eyes instead of the allergen-free items recommended in the original recipe. I also only made 3 because that made the plate look festive without taking too much fussy effort. I am not ashamed of my love for the PSL. When the weather dips below 70º I'll drink one every day, given the chance. Since I work from home and am not made of money, I've learned to make my own. The basic (no pun intended) PSL spice recipe is a 4:2:1 ratio of cinnamon to ginger to cloves. This is pretty easy to eyeball: I just sprinkle about the right amount in my hand, toss it in my mug, and add sugar. But first thing in the morning, even that can feel like too much work. My favorite PSL recipe is more complicated. It's a paleo recipe, but I've found it works fine even with a lot of adjustments to the ingredients. Coconut oil & maple syrup are really delicious, but you can also use plain old milk & sugar. I wanted to be able to make this quickly and easily without searching for 5 different spice jars, so I put together my own spice blend by doubling the quantities in the recipe linked above. I added some sugar to make it easier to sprinkle. Shake it up well, and you've got a ready-made PSL shortcut in your spice cabinet! Now I have everything I need to enjoy my favorite coffee drink at home, even if I'm not fully awake yet!